As current antibiotics dwindle in effectiveness against multidrug-resistant pathogens, researchers are seeking potential replacements in some unlikely places. Now a team has identified bacteria with promising antibiotic activity against known pathogens—even dangerous organisms, such as the microbe that causes MRSA infections—in the protective mucus that coats young fish. The researchers will present their results today at the American Chemical Society (ACS) Spring 2019 National Meeting & Exposition. "For us, any microbe in the marine environment that could provide a new compound is worth exploring," says Sandra Loesgen, Ph.D., the group's principal investigator. According to Loesgen, who is at Oregon State University, while novel chemical reagents have been found in the human microbiome, the marine equivalent remains relatively unstudied. One potential goldmine of microbes is the mucus that coats the surfaces of fish. This viscous substance protects fish from bacteria, fungi, and viruses in their environment, trapping the microbes before they can cause infections. The slime is also rich in polysaccharides and peptides known to have antibacterial activity. "Fish mucus is really interesting because the environment the fish live in is complex," says Molly Austin, an undergraduate chemistry student in Loesgen's laboratory, who conducted some of the studies. "They are in contact with their environment all the time with many pathogenic viruses." According to Austin, it would be interesting to figure out if anything in the mucus, which protects the fish, could actually help protect humans. Collaborator Erin (Misty) Paig-Tran, Ph.D., who is at California State University, Fullerton, supplied the mucus, swabbed from juvenile deep-sea and surface-dwelling fish caught off the Southern California coast. The team examined young fish because they have a less-developed immune system and more mucus on the outside of their scales that could contain a greater concentration of active bacteria than adult fish. Loesgen, Austin and graduate student Paige Mandelare isolated and screened 47 different strains of bacteria from the slime. 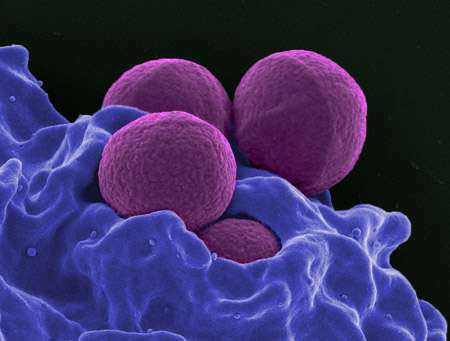 Five bacterial extracts strongly inhibited methicillin-resistant S. aureus (MRSA), and three inhibited Candida albicans, a fungus pathogenic to humans. A bacteria from mucus derived from a particular Pacific pink perch showed strong activity against MRSA and against a colon carcinoma cell line. Austin is now focusing her work on the Pseudomonas aeruginosa, a Gram-negative bacteria derived from that fish, to study the many potentially interesting phenazine natural products and antibiotics that this bacteria makes. While the team members are interested in new sources for antibiotics to help humans, they are also looking at other ways to apply this knowledge. For example, the study of fish mucus could also help reduce the use of antibiotics in fish farming by leading to better antibiotics specifically targeted to the microbes clinging to certain types of fish. But first, the researchers want to understand more fundamental questions. For example, "We don't even know what a healthy microbiome is," Loesgen says. She explains that it's unclear whether the bacteria they studied in the fish slime were typical of their microbiomes and are protecting their hosts, or if these bacteria just happened to hitch a ride on these individual fish. Learning more about healthy fish microbiomes and how environmental factors in the Pacific can affect them could help inform conservation efforts, the researchers say. More information: Diving into the Pacific fish microbiome: Exploration of antibiotics in a unique ecosystem, the American Chemical Society (ACS) Spring 2019 National Meeting & Exposition.